Our plumbers and HVAC technicians understand you have a choice when you are looking to find local plumbers. Most customers look online first to view the prospective company’s website, Facebook page, and overall reputation. Our team works very hard to put the customer first every day and are honored to have received the Best Plumbing Company in the Nashville Scene Reader’s Poll Awards for the past seven years in a row: 2012–2016, 2017 (finalist) and 2018 (winner). 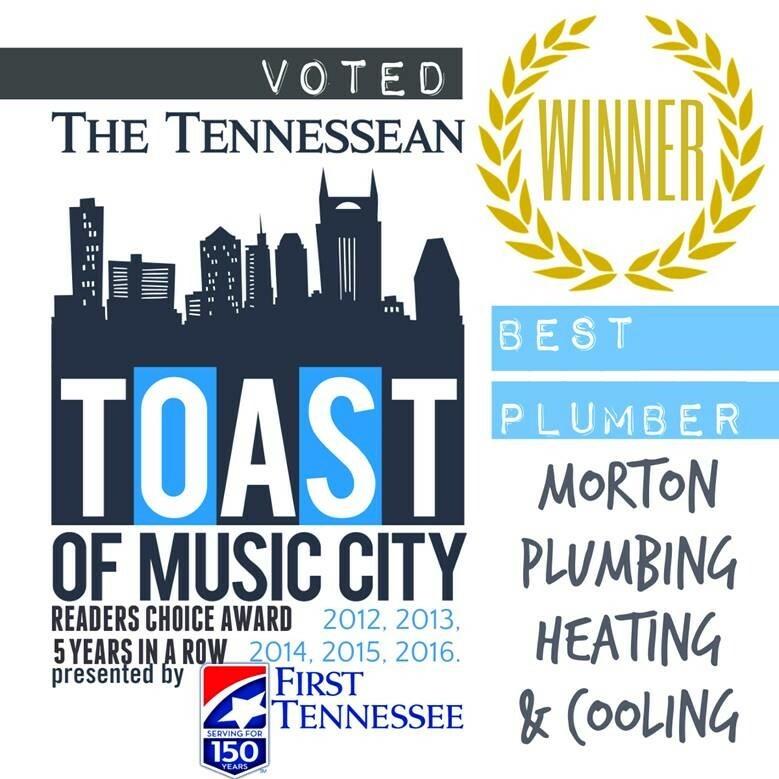 Morton Plumbing, Heating & Cooling won the Gold Medal Award for Best Plumber in the Tennessean’s Toast of Music City Awards for six years in a row (2012–2017). We thank our customers and friends for your support from the bottom of our hearts. Morton Plumbing, Heating & Cooling also received a Gold Medal for Best Heating and Cooling Company in 2015, 2016, and 2017, and the Silver Medal in 2014 in the Tennessean’s Toast of Music City Awards designating the best companies in Tennessee. 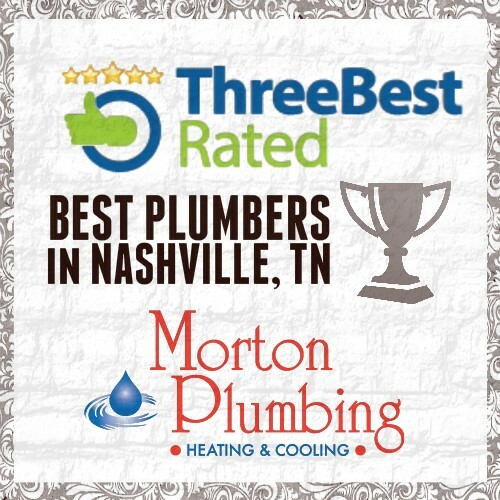 In 2015, 2016, 2017, and 2018, Morton Plumbing, Heating & Cooling, Inc. was selected as one of the top 3 plumbers in Nashville based on verified customer reviews, history of business, ratings, customer satisfaction, pricing and excellence by Three Best Rated. In 2017 and 2018, Morton Plumbing, Heating & Cooling was designated as a top pick and best reviewed plumbers in Nashville in the category of plumbers by Expertise. In 2018, Morton Plumbing had the best reviews on Yelp among all Nashville plumbers and received top honors as being the top plumbing company on Yelp. The company is also recognized by AmericaTop10.com as one of the ten best plumbers in Nashville. 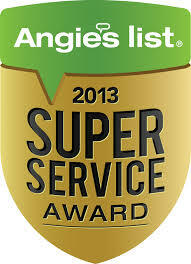 Morton Plumbing, Heating & Cooling’s exceptional ratings and reviews on Angie’s List resulted in our team winning the Angie’s List Super Service Award in the Plumbers Category for Nashville. 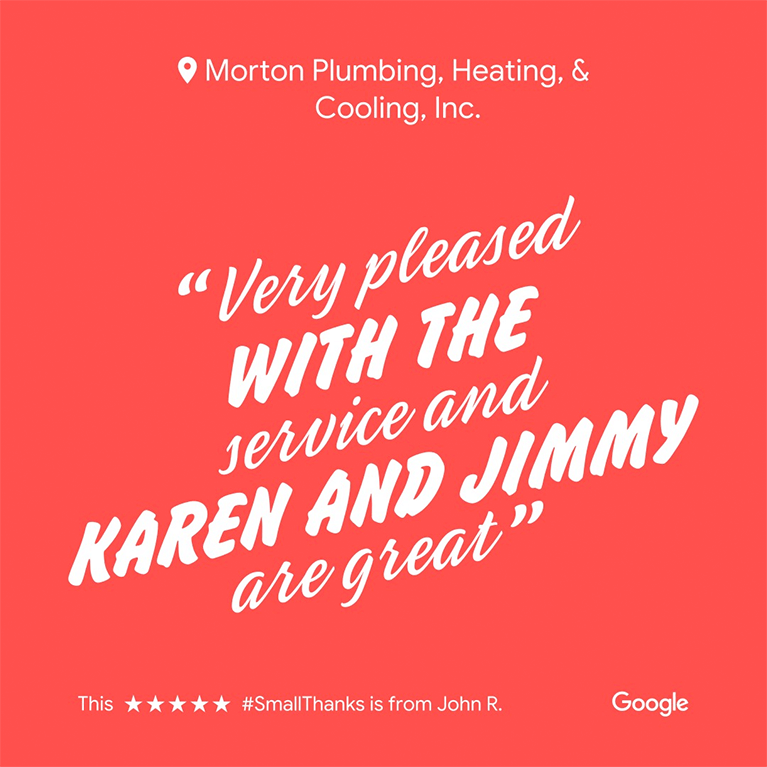 Morton Plumbing, Heating & Cooling is a certified Angie’s List member which is awarded to businesses with an annual criminal background check and a consistently maintained a top A rating and maintains proper plumbing and HVAC licenses. We cannot begin to thank our loyal customers and those who took the time to write reviews. Finding a good plumber is not an easy task. There are so many different plumbers from which to choose who all approach the job in a different way. That is why we guarantee our work and are committed to excellence. We do not pay our team using a commission structure. We decided long ago that we did not want to incentivize our team to sell products or services that may not be needed. Our plumbers and HVAC professionals provide advice and options based on the customer’s specific situation and needs. Below are some actual reviews left online about us. We encourage you to read our online reviews. Our customers have posted reviews on Google, Superpages, Angie’s List, Bing, Yelp, YellowPages, and more. Feel free to read all of our reviews or post your own review on Yelp, Google+, or Facebook. Very professional and timely service! These guys fixed my leaking shower faucet after I made the unfortunate mistake of using someone who came highly recommended on a local neighborhood FB page. Mr ‘Highly Recommended’ made the problem worse and left me without water for a week during the Christmas holidays.After calling Morton Plumbing I had running water and repairs complete in just a few hours. Quoted price was reasonable and ended up saving me over $200 in a new faucet system.Wonderful, friendly service and people. Highly recommend! Had them come to fix our shower drain. Very pleased with their service. Technicians are pleasant and professional and the dispatch service is friendly and reliable. A great option for plumbing work. I’ll use them again when something else goes wrong. I found Morton Plumbing via Yelp and I could not have been happier. I called and a human being answered the phone! Karen was courteous and very pleasant. She was able to schedule me an appointment the very next day. Karen called (as she said she would) first thing in the morning to confirm that someone was on the way … Dwayne arrived promptly and could not have been nicer. He calmly and thoroughly conducted a CSI investigation of why my outside hose bibs were not working. The problem was not straight forward but he discovered the solution in no time. He also “fixed” 2 other situations that I asked him about (a slow draining bathroom sink, and a smelly kitchen sink! Needless to say, I was very happy. Like I mentioned, Dwayne and Karen were great and I would recommend Morton Plumbing and would happily call upon them again. Great customer service AND competent service plumbers. After coming home at 9pm and finding my thermostat at 80 degrees and outside temp was 72, I was frantic. I messaged Jimmy Morton and one of his staff about my HVAC not coming on. Karen called me first thing in the morning and Jimmy messaged me and they had a man out here at 8am and worked on my HVAC for almost 4 hours and now my house is nice and cool and my pets and me are perfectly cool and happy. This company will be my go to co. for my personal homes and for all my real estate clients. Now I know why they are the best. Today, first time had Morton Plumbing come. Discovered them online while searching for Nashville area Plumbers. Disclaimer: The real test of any company is how they respond if something goes wrong. So, not sure how they will be if something goes wrong. However, TODAY THEIR SERVICE WAS SUPERB! They wore no cologne as I requested and had their own clean shoe covers w/out being begged to put on (Karen remembered to mention the cologne which meant a lot). 2 team members came, Josh and Isaiah, and WERE ON TIME AND KAREN CALLED BEFORE TO SAY ON WAY as promised; plus on the snow day, she called early that morning to say would have to reschedule; rather than I have to call them. THEY ANSWERED all ?’s, allowed me to sit and watch w/out telling me: “I know what I am doing so you can go and do your thing.” Rather, Josh said, you are paying, pull up a chair and ask away and watch. Worked so cleanly, carefully, and competently. Love that they deduct the service fee from total if you use them. They gave me estimates, for other things in future in writing. Love them and hoping all their hard work holds and if not they will stand by it, as Jimmy the manager promised when called to schedule. I have to say - and I say this very sincerely - I have never had better customer service in my life than with my recent experience with Morton. We had an AC unit die last month and I called Morton, who sent technicians out that afternoon. The men were not able to make the repair by the end of that work day, and Mr. Morton himself called me and truly went above and beyond to make the situation right. The next day, a brand new unit was installed and works perfectly. The installation crew was incredibly courteous and professional and again, I cannot say enough good things about this company, its’ owner and the way they do business. I called Morton Plumbing out for a visit to address a mildew smell in our house. They scheduled me for the next day with a two-hour afternoon time frame. They called in the morning to say they had a technician available earlier if I preferred. I unfortunately couldn’t make it work, but really appreciated that they called with the option. They showed up within the time frame, calling ahead to make sure I was available. The technician had great customer service, was courteous and made sure to put on the disposable shoe covers each time he entered the house. There was a dispatch charge but if they do any work they waive it. Also, the receptionist who answers the phone when you call is one of the most pleasant people I’ve ever had the pleasure of talking with. Thanks to Morton Plumbing Heating & Cooling for a completely painless install of a new water line. This team knew what they were doing and managed to replace an 80 year-old water line with minimal disruption of our lawn and front garden flower beds. The work was done as promised/scheduled and at a very reasonable cost. We will definitely use Morton again and refer them to others. They are the plumbing company I depend on. Always professional. Always do good work, and always respond quickly. There was a slight problem with the pressure after they installed and they came back to fix immediately. Sim came today and fixed the a.c. unit and told me that all that was needed was a thermostat. I had previously called another company and they told me I needed a whole new unit. I appreciate honesty more than anything and this company now has a customer for life. HIGHLY RECOMMENDED! Thank you so much Sim for all your hard work and help today! So happy with my recent plumbing service! These guys were fast, efficient and affordable. I recommend them highly. 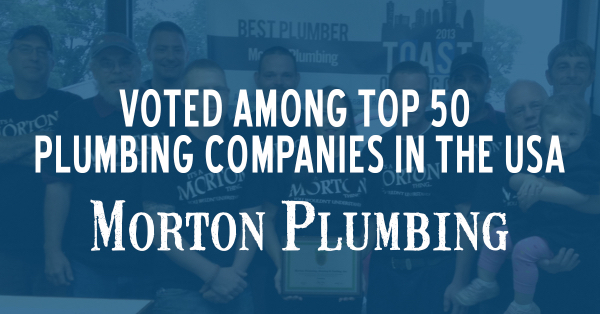 I just want to let everyone know what a great company Morton Plumbing is! You were the only company to NOT say, “Well, in order to fix the leak, you will have to replace all of your bathroom pipes!” (even though they aren’t even 7 years old) Thanks for the great service, and for the great customer service. If you are in the market for a plumber that is honest, look no further. These guys are the true deal! We had three different plumbers from other companies come to investigate water puddles I had found in the basement before calling Morton Plumbing. None of the others could figure out what was wrong. Rick from Morton Plumbing quickly diagnosed the problem, found the leak in the pipe behind the shower handle, and was able to fix it. Professional, honest, and good at their jobs. They will definitely be the first company I call if I have a plumbing problem in the future. Very professional and timely service! These guys fixed my leaking shower faucet after I made the unfortunate mistake of using someone who came highly recommended on a local neighborhood FB page. This plumber made the problem worse and left me without water for a week during the Christmas holidays. After calling Morton Plumbing I had running water and repairs complete in just a few hours. Quoted price was reasonable and ended up saving me over $200 in a new faucet system. Wonderful, friendly service and people. Highly recommend! 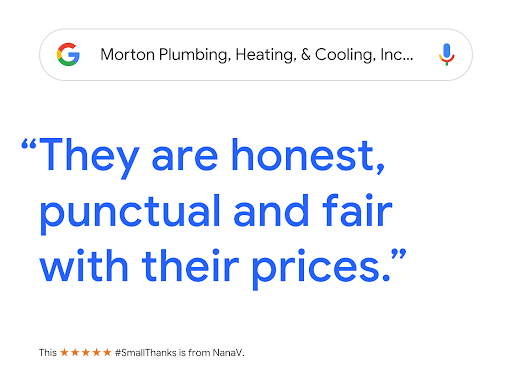 Morton Plumbing is quick, responsive, and everyone I’ve spoken with was as nice as can be. As a new-ish homeowner, they walked me through everything and I found them so nice to work with and they did a great job. (The technician also showed up within the scheduled window- always a bonus for me!) I had a shower with a faulty lever and cartridge, and he fixed it in under an hour for a reasonable price. Morton is a family owned and operated company. The owner’s two sons work here. They were able to come right out to repair our busted water heater. I purchased the water heater myself and they installed it for a flat rate. They quoted me the price up front (no hidden charges) and it included everything. I recently had another plumbing company charge me as much for a drippy faucet. No joke. Terrific plumber. Had a leaky pipe under the house that turned out to be a lot trickier to fix than first anticipated. Despite the fact it took twice as long as Rick Morton thought it would, he stuck to his original quote, fixed the leak and did it all in a friendly, professional manner. I’ll definitely be calling them again if I have another plumbing issue. I’m a repeat plumbing customer of Morton Plumbing, Heating & Cooling, and will call them for HVAC work too. Our air conditioner recently was serviced by this company. They train their crew to be respectful. They take off their shoes or wear covers so they never track in dirt or mud into your home. In all the years they have come and serviced our toilets, water heaters, clogged drains, they have never asked to use the restroom. I would not have minded, but they obviously take care of that before they enter my home and I admire the professionalism. They guarantee their work but I have never had to have them come back and fix something. They do it right the first time. We own an older home and are in the process of fixing it up. Being a younger home owner, I’m sometimes worried about being taken advantage of. We are working on laying a patio and in the process ran into a drain we weren’t sure how to deal with. We received several opinions but finally opted to get a professional one. Tim from Morton Plumbing came out to our house and checked out our situation. He was so friendly and helpful. He explained exactly what we were dealing with and gave us an option for how to work around it ourselves or a very, very reasonable quote for Morton to come out and do the work. I was so thankful for his help and will definitely be using Morton for any plumbing needs in the future. **Updated: We had Tim back out to the house to do some minor maintenance to our toilet and garbage disposal. Again, very professional, courteous, punctual, and fair. We’re so glad to have a plumbing company we can trust. When I had a plumbing emergency, I felt I really was at a plumber’s mercy. I had heard about the service Morton Plumbing had provided to some of my business acquaintances and decided to call their office. They saved me, stopped the leak in my wall, and even cleaned up the mess. I know they must have put us at the top of their list, because the plumbing truck arrived within 10 minutes of my call. 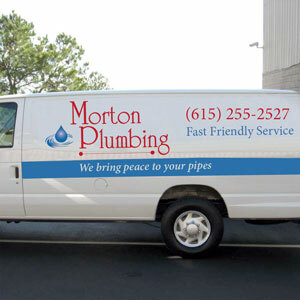 I am so glad I called Morton rather than any other plumber. I am sticking to them for any other emergency and when my water heater needs replacement. I was very pleased with the work Jimmy Morton’s firm provided me when I had to rebuild my house after the May 2010 flood in Nashville. His staff did quality work at a fair price and accomplished it in the time promised. I now have a friend and professional I will call on whenever I have future plumbing repairs and projects. Thanks, Jimmy. Our plumbing company serves Nashville TN and surrounding areas. Need plumbing or HVAC service? Gold Medal Winner 2012 - 2017. Gold Medal 2015, 2016 and 2017. 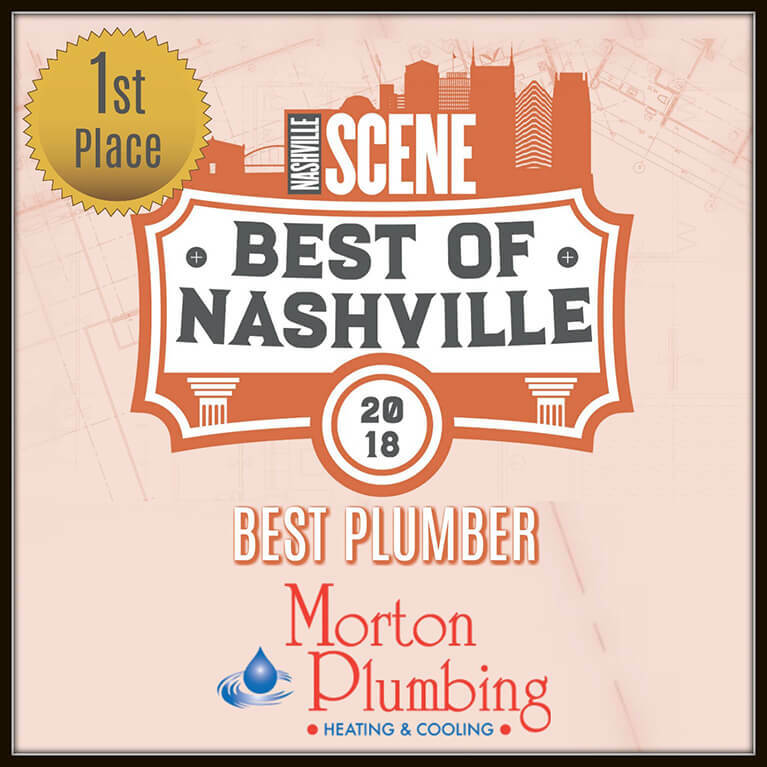 Morton Plumbing wants to thank our customers, fans, and friends for voting for us as Best Plumbing Company in the 2012, 2013, 2014, 2015, 2016, 2017 (finalist), and 2018 (winner) Nashville Scene Readers’ Poll. We are honored to have been recognized at the award ceremonies. We will strive to be the best plumbers in Nashville and earn your business with every service call.